The mainstream print news media has been in sharp decline as more and more people opt for the electronic delivery of information. Unfortunately, an iPad running the New York Times app doesn't work very well to potty train puppies. That's the problem animal shelters face in San Francisco. Animal Care and Control has been relying on donations of the San Francisco Chronicle and other newspapers to line the cages of un-housebroken puppies, and paper supplies are dwindling. The San Francisco Public Library has promised to donate old newspapers, but it remains to be seen if this will solve the problem. 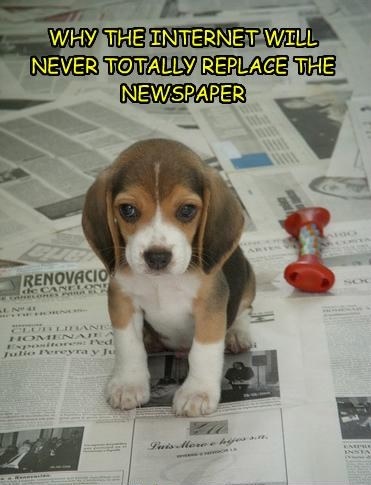 It is rather unfortunate that newspapers are becoming more scarce when people actually have a need for them. And you can't very well roll up the Internet to swat your misbehaving puppy either.